Black Scorpion Royal balm Thai Balm Banna contains in its composition over a hundred different unique medicinal herbs, coconut oil and extracts of Scorpion venom. 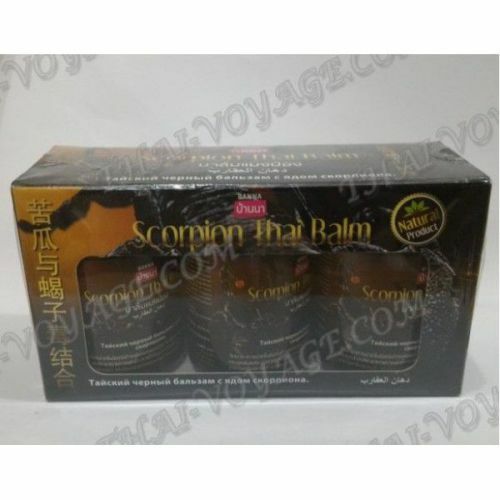 Scorpion venom significantly speeds up the process of penetration into the body tissues of all useful components of balsam and accelerates their therapeutic effect. This balm has analgesic, anti-inflammatory and anti-edema effect. Accelerates the process of healing bone fractures. Treats bruises, sprains, dislocations, arthritis, arthrosis, osteochondrosis, rheumatism, sciatica. Helps with inflammation of the joints, strengthens bones in osteoporosis. Stops the increase in the joints in gout, inhibits the process of calcification. Improves blood circulation, is used for the treatment of varicose veins & heel spurs. Effective balm for insect bites. Relieves itching, pain and swelling. Does not cause a strong burning sensationApplication: balm is recommended to apply massage movements 2-3 times a day to clean the body and RUB in until completely absorbed. Contraindications: hypersensitivity, idiosyncrasy.Balm should not be applied to damaged skin and wounds.